Listening to Live At Little Gem Saloon: Basin Street Records Celebrates 20 Years, with Jason Marsalis, Kermit Ruffins, Irvin Mayfield, Bill Summers, Dr. Michael White, and Davell Crawford will have you wanting to book an immediate trip to New Orleans to listen to more great Jazz; it's that good. Celebrating Basin Street Records' 20th anniversary, the 9-track Jazz release includes top New Orleans musicians Jason Marsalis, Kermit Ruffins, Irvin Mayfield, Bill Summers, Dr. Michael White, Davell Crawford, Oscar Rossignoli, Jasen Weaver, Gerald Watkins, Yoshitaka "Z2", Kevin Morris, Jerry Barbarin Anderson, Ronald Markham, Gregory Stafford, Seva Venet, Devone Allison, Jameison Ledonio, Shelly Spruill II, and Leshawn Lee. 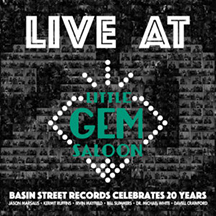 Live At Little Gem Saloon - Basin Street Records Celebrates 20 Years was produced by Tracey Freeman and Executive Producer Mark Samuels on the Basin Street Records label. Basin Street Records has an interesting backstory that I learned when I interviewed President and Founder Mark Samuels back in 2008, when the company celebrated their 10th anniversary. When I asked Mark about how he got into the industry, he replied, "I got into the music business as a fan. I was a sax player in a high school, and later in a band in college that played fraternity parties. I worked on a music project for my brother that later evolved into Basin Street Records. I have always said that I aspire that Basin Street would be to New Orleans what Motown is to Detroit. For musicians, this is the place. Music will be around forever. Since Katrina, it is even more important what weare doing." Fast forward another 10 years, to Basin Street Records' 20th anniversary, and the label is still going strong, producing world-class music celebrating the unique quality of New Orleans and the artists it represents. Congratulations to Mark Samuels and the Basin Street Records label team and artists on a hard-earned achievement. In the liner notes of Live At Little Gem Saloon: Basin Street Records Celebrates 20 Years, with Jason Marsalis, Kermit Ruffins, Irvin Mayfield, Bill Summers, Dr. Michael White, and Davell Crawford, Mark Samuels wrote: "20 years. Basin Street Records began as a night and weekend hobby in September 1997. We've grown to a label with music from 15 artists who represent the very best of New Orleans' and the world's music. To kick off our 20th anniversary we asked many of our artists to participate in an event at the Little Gem Saloon during Jazzfest in 2017 - on two stages, on two floors in this musically historic and spectacularly renovated building. This album is a taste of that night. Come visit New Orleans and look for our artists in a city near you. We invite you to find us on social media and appreciate you staying in touch." The 9-track release opens with "vibes" master Jason Marsalis' song titled Bourbon Street Ain't Mardi Gras, which is 9+ minutes of instrumental magic. Next up is At The House, In Da Pocket, another Jason Marsalis song, that he explains as one he wrote back in highschool, giving the listener a glimpse of his early creative force and his continuing musical genius. The release continues with the 1930 song, On The Sunny Side Of The Street written by Dorothy Fields and Jimmy McHugh featuring the impressive double trumpets of Irvin Mayfield and Kermit Ruffins. Kermit Ruffins and Irvin Mayfield once again team up on the rollicking 1947 song, Skokiaan, written by Tom Glazer and August Musarurwa. Los Hombres Calientes heat up the 1945 song, Autumn Leaves, written by Joseph Kosma, Johnny Mercer, and Jacques Prévert, followed by Dr. Michael White on clarinet doing justice to the ever popular, Summertime, written in1934 by George Gershwin, Ira Gershwin, Dubose Heyward, and Dorothy Kuhns. Dr. Michael White continues his groove on his original song, Give It Up (Gypsy Second Line), which is 9.53 minutes of pure listening pleasure. Get your parasol ready to twirl and your dancing shoes on as this is a song that will have you joining the Gypsy Second Line. Joining Dr. Michael White on clarinet, are Jason Marsalis on drums, Gregory Stafford on trumpet, Mark Brooks on bass, and Seva Venet on banjo. Davell Crawford struts his fingers on the piano and adds his vocals on the up-tempo 1961 song, Big Boss Man written by Luther Dixon and Al Smith, and is joined by Bill Summers on percussion, Devone Allison on keyboards, Jameison Ledonio on guitar, Shelly Spruill II on bass, and Leshawn Lee on drums. The release closes with an original Davell Crawford love song to Louisiana on Don't Ever Be Blue/Ode To Louisiana with Davell Crawford on piano joined by Bill Summers on percussion. Live At Little Gem Saloon: Basin Street Records Celebrates 20 Years, with Jason Marsalis, Kermit Ruffins, Irvin Mayfield, Bill Summers, Dr. Michael White, and Davell Crawford is a perfect release to celebrate Basin Street Records' achievement, and the lasting legacy of New Orleans music. Throughout the years Luxury Experience has had the extreme pleasure of listening to, and covering, Basin Street Records talented artists' releases, as well as covering their live performances, including Kermit Ruffins, Jason Marsalis, Irvin Mayfield, Dr. Michael White, Henry Butler, Jon Cleary, Theresa Andersson, Rebirth Brass Band, Los Hombres Calientes, the Headhunters,and Davell Crawford, and as they say in New Orleans, this release is a pure lagniappe, which means "something given as a bonus or extra gift," and it indeed is that. Happy 20th anniversary to Basin Street Records, may this just be the start of a long legacy of anniversaries to come. For information on Basin Street Records please visit the website: www.BasinStreetRecords.com and Amazon. Follow Luxury Experienceon Facebook at www.facebook.com/LuxuryExperience to see photos and videos. © January 2019. LuxuryExperience. www.LuxuryExperience.com. All rights reserved.